The summer term is upon us, bringing long hours in the edit suite, ongoing placements and the occasional ray of sunshine. As the current FTV cohort embarks upon this next phase of the MA, we wanted to take a moment to congratulate them on a fantastic achievement: an immersive screening of 80s classic movie The Breakfast Club, held in mid-March, which had the highest attendance ever for any FTV event. Over the next two months, a team of FTV students worked together to cast actors, design posters, organise rehearsals and run a social media campaign – all alongside their ongoing placements and coursework. We knew the event was proving popular on the festival booking system, but it was still quite astounding when over 100 people arrived on the evening of 14th March. Who knew 40 croissants, 50 mini boxes of cereal and an array of fruit and muffins could vanish so quickly? With breakfast served, the evening continued with the Stop/Start One Minute Movie Competition entries. 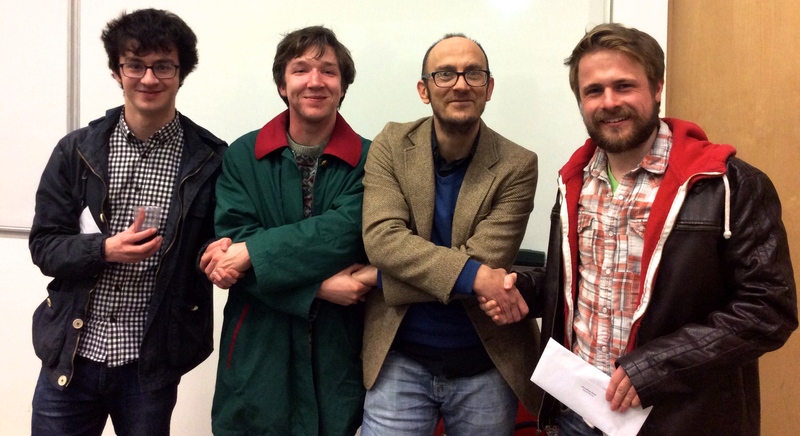 Prizes were awarded, with first place going to ‘The Third Law‘, by Lorhren-Rose Joseph and Denyce Blackman. On to the main event, and the audience sipped tea and coffee as five undergraduate students took their seats for detention and acted out iconic scenes as the brain, the athlete, the basket case, the princess and the criminal. It was fantastic seeing the characters come to life in the lecture theatre as their 1980s counterparts appeared on the big screen, and wonderful to share the experience with so many film-loving students and members of the community. A huge congratulations to Zoe and the FTV team for creating such a memorable evening, and thank you to Flatpack for all their support. Bring on 2019! In welcoming the new cohort of FTV postgraduate students to the University of Birmingham, the course leaders and Professor Roger Shannon scheduled an afternoon tour across the ‘second city’ for a glimpse at its various media and art centres. Samuel James shares his experience of the day. Taking place in Week 1, on Friday 30th September 2016, Professor Shannon met with all the students inside Birmingham New Street train station at 1pm. He provided us with introductory leaflets about the city’s media and arts before explaining where we’d be visiting on the scheduled tour: the famous Electric Cinema, BBC Birmingham, Everyman Cinema, the Ikon Gallery and local chains at Cineworld and Odeon. The first stop was the Electric Cinema, the nearest to New Street station and the oldest running cinema in the United Kingdom. Upon our arrival at the Electric, Roger took a number of group photos outside before going inside and introducing us to Sam Bishop, the cinema’s duty manager. Sam presented us with an insight into the history of the Electric Cinema, provided resourceful advice on working in the film and TV industry and discussed what the Electric offers customers. He even mentioned private screenings and suggested that FTV students organise one after completing audio-visual dissertations. For more information on the Electric Cinema, be sure to watch the documentary about it called The Last Projectionist. We then began our stroll through the city centre before eventually passing through the Mailbox and finding the current offices at BBC Birmingham. After another group photo, Roger guided us inside and we lovingly observed BBC sets and props of its famous TV shows, including costumes from Peaky Blinders. We also had some fun with the BBC Weather equipment. Upon leaving, we arrived at the Everyman Cinema just round the corner. Similar to the Electric Cinema, their duty manager showed us around and presented some factual information about the company. He also briefly guided us into an auditorium and allowed us to sit on their newly allocated sofa seats. Taking a few steps outside of the city centre, we passed by the Ikon Gallery. There was no official tour as we passed through like customers, but it gave us a further insight into the city’s art outside of cinema and media. At roughly 3pm, we moved onto mainstream cinema in the industry by visiting the Cineworld chain at Broad Street and Odeon at New Street. Supervisors from both industries gave us a thorough tour around the building, discussed the growing changes of cinema and, at Cineworld, showed us the projectors. We finished the tour at approximately 4pm. Although some students went home afterwards, others stayed in Birmingham for some drinks at a nearby pub which Professor Shannon previously recommended. Therefore, the FTV students of 2016-2017 considered this as not only an insight to Birmingham’s media and arts centres, but an icebreaking afternoon to build friendships and potential film and TV partnerships. Thank you to Roger for showing us the city! The Department of Film and Creative Writing is pleased to announce the 2016 One Minute Movie Competition. Run in association with the University’s Arts & Science Festival, this opportunity is open to all Birmingham students, both undergraduate and postgraduate. The challenge is to make a film on the theme of memory or forgetting (or both) that is less than 60 seconds long. It can be fact or fiction, literal or abstract; we want you to be as creative as possible. Specialist equipment is not a requirement and entries produced using smartphones or tablets are very welcome. Winners will be announced at a screening event on 15 March 2016 and the first prize is an Amazon Kindle Fire HD. Runners up will receive Amazon vouchers. If you have any questions, please email Dr Richard Langley r.m.langley@bham.ac.uk or ask Jemma Saunders in the Film & Creative Writing office (Room 415, Arts Building). You can also find out more on the department website. The deadline is Friday 26 February at 1pm. We look forward to receiving your entries! Our new cohort of FTV students are now well into their first term at Birmingham. We’ve had an exciting timetable packed with seminars, screenings, guest workshops and practical training, and last month we also arranged a trip to the Mockingbird Theatre in Digbeth, led by Professor Roger Shannon. In this blog, Magdalena Swiatek shares her reflections on the day and some fascinating insights into Birmingham’s film culture, past and present. In Week 2 we – the new FTV Students – took a trip to the Mockingbird Theatre in the Custard Factory to meet Roger Shannon, producer and Professor of Film and TV, and alumnus Luke Smith, who had just finished the MA. Luke showed us his amazing dissertation documentary about his first stand-up performance and talked about his experiences during the MA. He recounted the process of filming, his successes and the mistakes he made. It was motivating to hear how a former student experienced the year on the course and I´m sure all of us took a lot out of this meeting. Afterwards, Roger Shannon gave us an overview over Birmingham´s film history and its meaning for the UK film industry. Even though the industry is not quite as vivid as it was before in Birmingham, there are still loads of opportunities for us to discover here. Birmingham´s film history started in 1862 with the discovery of celluloid. Around 60 years later, in the early 20th century, three Brummies – Michael Balcon, Victor Saville and Oscar Deutsch – started to take over the film world from the West Midlands. Michael Balcon (1896 – 1977) – the honoured film producer who discovered Alfred Hitchcock was born in Birmingham. After the war he and his friend Victor Saville opened a film distribution company in London and started to produce films. In the late 1930s, Balcon was Head of the Ealing Company, one of Britain´s most famous studios. Victor Saville (1895 – 1979) – the film director, producer and screenwriter celebrated his success in the UK as well as in Hollywood. During his life he worked on over 70 films. Oscar Deutsch (1893 – 1941) – the founder of the ODEON cinemas was born in Birmingham as a son of Hungarian Jews. The first ‘Oscar Deutsch Entertains Our Nation’ (ODEON) – cinema was opened close to Birmingham in 1928. After this, many others followed all over the UK. 10 years later there were already over 250 ODEONs. The architecture and interior design were their unique recognition value. Today the ODEON remains one of the most important cinemas in Birmingham. The ODEON – located in the city centre of Birmingham, the ODEON prides itself on offering the best cinema experience, just as Oscar Deutsch promised. With 8 screens, the cinema offers a variety of current films. Cineworld – on Broad Street, surrounded by pubs, clubs and restaurants, the cinema is located in the heart of the city. With 12 screens, the Cineworld offers a big range of top films for every age and interest. The Electric – the oldest working cinema in Britain has been showing films since 1909. On two screens the viewer can experience loads of indie films, performance screenings and classics in addition to the latest film releases. A regular view of the program is worthwhile. Midlands Arts Centre – one of the most important and diverse art centres in Birmingham; offering exhibitions, courses, theatre, music and of course films. It shows a range of new released films, art-house films and live screenings. Everyman Cinemas – this independent cinema is located in the Mailbox in Birmingham. The uniqueness of this venue is its atmosphere and fancy cosiness. A big thank you to the team at The Mockingbird for hosting us, and to Roger and Luke for sharing their knowledge and expertise! Announcing the One Minute Movie Competition Winners! On Tuesday evening we welcomed visitors to our third annual screening event, showcasing work by recent alumni of the MA. At the start of the second half, entries to the inaugural One Minute Movie Competition were also screened, and the winners were announced. The judges were hugely impressed by the range of creativity in all the submissions and awarded first prize to Dan White (BA American & Canadian Studies and English Literature) for his film An Interesting Trip. 22:00 – A team effort from Jack Crowe, Vafa Motamedi, Tom Lofkin, Anya Hancock and Cameron Blair. A big thank you to all who entered and everyone who attended on Tuesday. Congratulations to the winners! Left to right: Vafa Motamedi, Jack Crowe, Dr Richard Langley and Dan White.